When I first saw this book cover and title, I instantly thought of the film 500 Days of Summer which I believe has the opening line "This is NOT a love story...". Having just received This is a Love Story, the opening line is of the press release is "A quirky modern love story reminiscent of 500 Days of Summer" so I am now even more excited to read it. The publishers of This is a Love Story have kindly offered one copy of this book to winners of a valentines day competition for my blog readers. 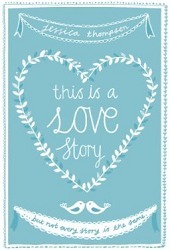 For your chance to win a copy of This is a Love Story by Jessica Thompson, follow the steps in Rafflecopter. Most recently, it has to be Johnny Foote from The Help because he loved his wife despite what everybody else thought about her and supported her when she really needed him.